Free shipping to United States with $75 purchase from Shannybeebo. See item details below for sale terms. This unique wall clock is a zero waste option for your timing needs. The Shannybeebo original paper bead clocks have been featured worldwide for their eco friendly design. 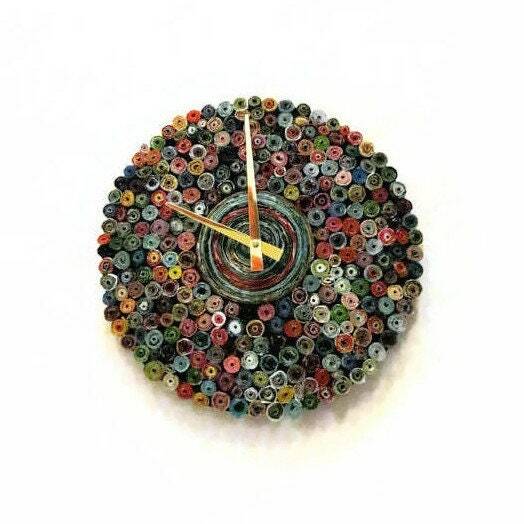 Each wall clock is meticulously created using hand rolled paper beads. Clock shown is 12" in diameter. Choose your clock size from the drop down menu. Equipped with a metal wall hanger for easy and secure hanging. There are many ways to customize this clock. Please send a message to discuss color, hand or size options. My creations are never quite the same. Each clock will vary in color, feel free to reach out to discuss options. Special offer details: Spring Sale! -Save 15% off your order. -Applies to all orders, including Custom Orders. Free shipping details: Free Shipping! -Applies to qualifying orders of $75 and up. -Covers USPS First Class Shipping for domestic orders. It shipped on time, even during the holiday rush! Shannybeebo was prompt in answering my questions as well. The clock is beautiful and my mom was very happy to receive it as a present! It's a very cute clock and just right for where I wanted it. I feel it's somewhat over priced. Shannybeebo was very helpful!